Lush made this lovely ‘Mistletoe’ Christmas 2016 bath bomb with their popular “Silky Underwear’ scent. It’s a lovely smoky vetiver and jasmine fragrance. It almost smells as if there is a dash of vanilla in there too, but there isn’t any. The ingredients lists holly lustre, but i didn’t see any sparkle to this nor in the water? It’s not a jasmine fragrance of the strongest kind, such as, Flying Fox, Floating Flower, Godiva. Yes Yes Yes, or Lust. This is a more sultry jasmine, not too strong. It has a slight sweetness to it, and a deep vetiver note. Vetiver has an earthy and smoky aroma, it feels restorative and relaxing and has been referred to as the oil of tranquillity. Don’t get caught under the mistletoe this Christmas; pop it straight in the bath and leap in! A dizzyingly romantic, sweet-as-kisses bundle of heady jasmine and sultry vetivert begin your festive romance. As floral layers of colour fizz away they conjure up a nostalgic fairy tale fragrance that’s sure to sweep you off your feet. While this has no glitter in it, i do’t miss it. This is such a beautiful and perfect bath bomb. This is a cute re-usable bubble bar wand in the scent of Lush popular Honey I Washed the Kids fragrance. It’s a cute green dinosaur wearing a red santa hat. I couldn’t believe how many bubbles this made with barely leaving the water run on it for only a minute! I can see how this would be economical because one could get two or three bubble baths out of it. Here’s a six minute demo video i made of this cute little guy in the bath tub. This is a facial cleaner scrub, a limited edition for Christmas. Though most people like the “Let the Good Times Roll”, Buche De Noel is much more interesting and is more appropriate for my kind of skin. It’s more moisturizing then LTGTR. It is chock full of various goodies; Almonds, oranges, cranberries, brandy, cedarwood. It has a holiday kind of vibe to it. It’s a coarser faical cleanser than other Lush facial cleansers like let the good times roll, herbalism and angel’s delight. I liek the chunkiness of it. It’s perfect for my skin. Lush Times: Buche de Noel was around last Christmas, but it went by the name of Santa’s Rice Porridge. It’s back this year with a few tweaks; it’s still fresh and preservative-free, but it’s a fresh cleanser now. We make it like a nutritious pudding with a twist. See my short demo of rose jam shower gel up close, below. 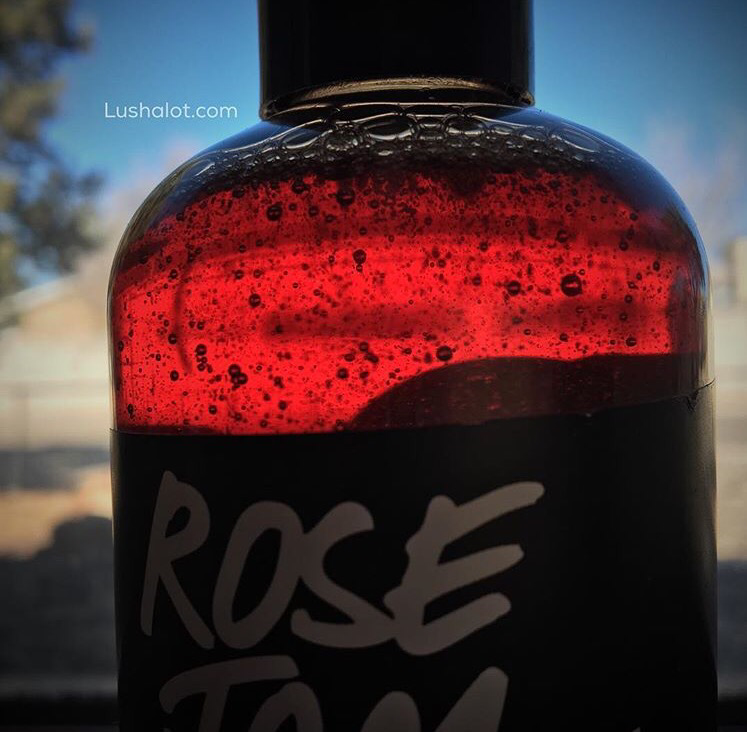 Description: Our Rose Jam shower gel with its sweet, addictive scent is back by popular demand. With a vanilla pod infusion, goji berry juice and vitamin rich, nourishing argan oil, this shower gel is truly indulgent. People who love Rose Jam Bubbleroon and Ro’s Argan Body Conditioner will love this too as we use the same floral, fruity-smelling combination of Turkish rose absolute and geranium oil. Here’s a short video showing Rose Jam shower gel. 2017=Twilight scent; lavender, tonka, ylang ylang. 2017 Description: This year, our Lil’ Lush Pud has had a luxurious makeover… with a soothing lavender fragrance and calming pastel colours, this bath bomb is perfect for bed time, or any time you want to relax. This bath bomb shares a fragrance with our Twilight bath bomb. With lavender oil, ylang ylang and tonka absolute, you’ll be soothed and calmed as little islands of colour float out into your bath water. Mood brightening, zesty bergamot oil and juicy cassis absolute give you a sweet, reassuring soak like a big cuddle in the tub. Feel at ease as cypress oil keeps you feeling joyful and refreshed, soothing and easing you into relaxation. A confetti of colours cascading across the water makes for a perfectly cosy winter’s night. Here’s a demo of this beautiful thing in the tub up close so you can see the glitter in the water.